The exotic-looking Silk Floss Tree stands out in any garden or park for its intensely-colored blossoms, its unusual seed pods, and its thorns! This relatively fast-growing tree, know botanically as Ceiba speciosa, is native to southern Brazil and Argentina. The fabulous blooms are either bright pink-and-white or all-white, depending on the species, and resemble oversized hibiscus flowers (understandable, as the two plants are closely related). Silk Floss Tree blossoms are so big, so vibrant, and so prolific, that they really catch your attention, even from a distance. The blooms are followed by plump seed pods that look like dangling sausages, which later dry and crack open to expose big balls of white cotton-like stuffing – which gives the tree the common name of Silk Floss. The soft, fluffy fibers easily blow off in the winds, like drifts of cotton candy, carrying with them all the little black seeds for dispersal. The trunk is truly remarkable, because it is naturally covered with very large – very numerous – and very sharp – thorns. Fortunately for the gardener, these scratchy features can be eliminated if the tree is grown from a graft, leaving a smooth trunk with light-green bark. 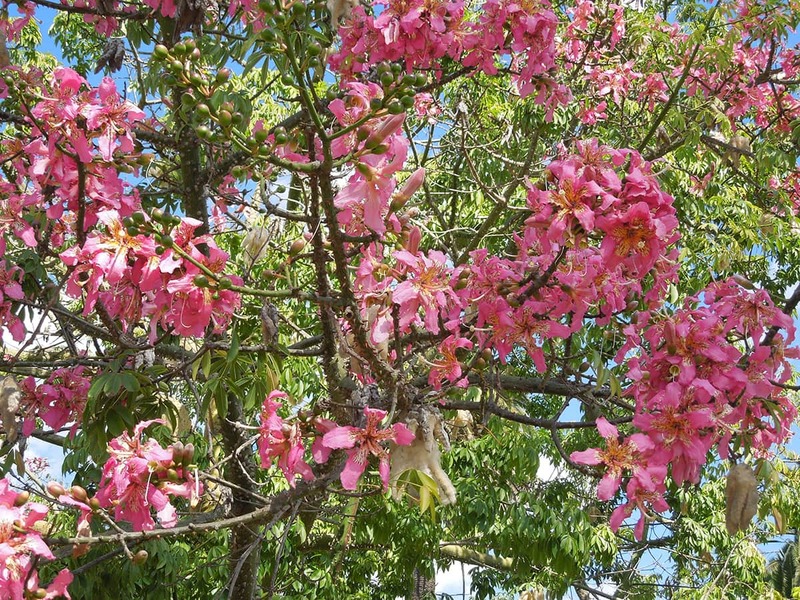 The Silk Floss Tree grows best in deep soils, but it can be grown in most areas of our City. It requires only an occasional deep watering; an established tree is quite drought tolerant. It will drop its leaves if the temperature drops below 27 degrees, but will re-foliate when the weather warms. With ideal conditions, it can get to be a large tree, growing to 50 feet in height with a 40-foot spread. However, most of these trees in town remain much smaller. 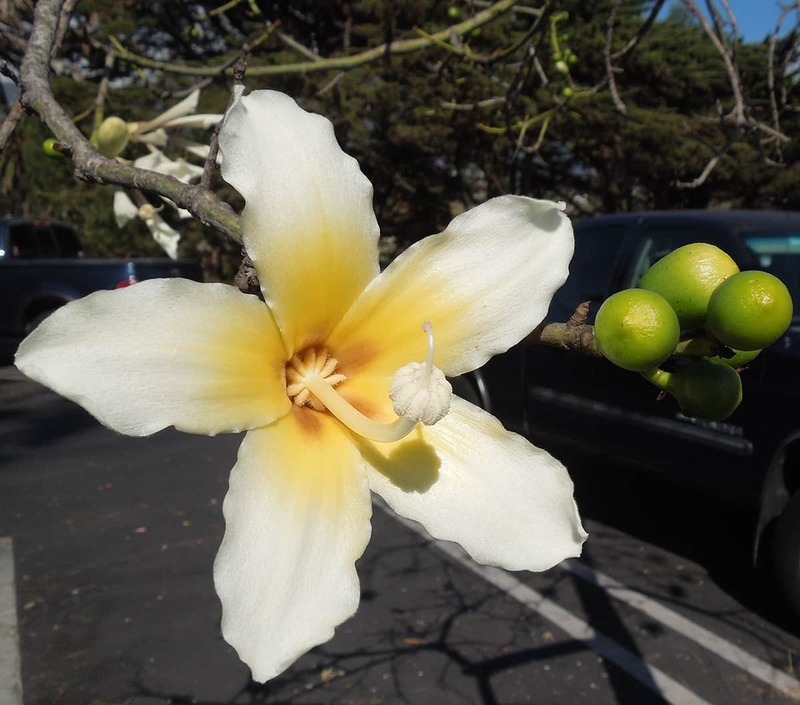 Mature Silk Floss Trees are street trees in the 2400 block of Santa Barbara Street, the 200 block of East Yanonali Street, and the 200 block of South Voluntario Street. Both the pink-flowering and the white-flowering species can be seen in the Alice Keck Park Memorial Garden and at the Santa Barbara Zoo.